This year, the automotive world is as mixed up as the real world. Nico Rosberg wins the F1 World Championship and then quits just five-days later. All conquering Audi pull out of the World Endurance Championship. Volkswagen retire from World Rallying. Bentley build a diesel. Porsche fans are left equally banjaxed. 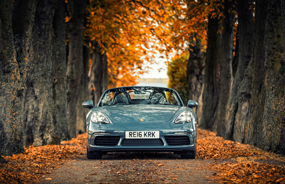 The news in early 2016 that their new Boxster is to get a four-cylinder turbo-charged engine instead of the legendary naturally aspirated flat-6 might well have been the most shocking of all. What was the world thinking? A little while ago I have the chance to sample the new Boxster. Or should I say the new 718 Boxster – and in sportier S form no less – both on the road and on the track. It’s different, I can’t deny that. But honestly, there’s little cause for concern. Believe it or not it’s actually 20 years since Porsche introduced the Boxster, the mid-engined two-seater that soon became the go-to benchmark roadster. Whilst traditionalists may lament the passing of that 6-cylinder amidships motor, it’s also worth remembering that original 718s built between 1957 and 1962 were four-cylinder powered too. They boasted just 1.5 litres and approximately 145bhp. But that didn’t stop Edgar Barth and Wolfgang Seidel winning the 1959 Targa Florio outright. And neither did it prevent the bespectacled Masten Gregory winning his class in one in the 1961 Le Mans 24 hours either. Needless to say, the four-cylinder boxster engine that powers the modern 718 displaces a few more cubic centimetres, and produces significantly more bhp. The standard 718 Boxster develops 300 hp (220 kW) from its turbocharged 2.0-litre engine. Whereas the 718 Boxster S packs a 2.5-litre engine which develops 350 hp (257 kW). Its greater power is literally boosted by its use of a turbocharger with variable turbine geometry. Porsche incidentally is now the only manufacturer to offer such technology in production cars with petrol engines. The addition of the turbocharger also significantly boosts torque. 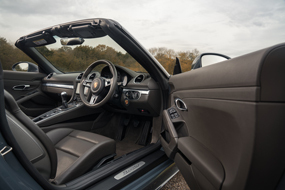 The twist-action of the 2.0-litre engine in the 718 Boxster has increased by nearly a quarter: 280 lbft of torque is now available from 1,950 rpm to 4,500 rpm whereas the 718 Boxster S now generates 310lbft between 1,900 rpm to 4,500 rpm. Consequently, performance is up too. The 718 Boxster – with optional PDK double-clutch automatic transmission and the Sport Chrono Package – sprints from 0-62 mph in 4.7 seconds. The equivalent 718 Boxster S in just 4.2 seconds. The top speeds, where allowed of course are 170 mph, and 177 mph respectively. The electro-mechanical power steering system has also been configured to be ten per cent more direct. 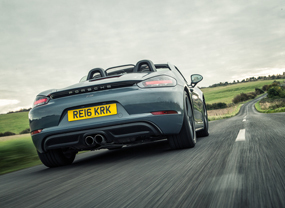 Make no mistake, the Boxster is now seriously quick. Sat low in its snug fitting seats, and behind the perfectly positioned thick-rimmed steering wheel and beautifully weighted pedals you can drop the hood in less than 10 seconds (and at speeds of up to 40Mph). The view down the now wider bonnet and over those famous wing tops is a familiar one. As is the dashboard with the rev-counter sitting centre stage. The accompanying soundtrack is, however, different. The metallic bark of the old flat-six on start-up is gone. The new engine sounds gruffer, more monotone, and a tad uneven. The chainsaw-like wail at high revs of the old motor has gone too. The musical accompaniment higher up the rev-range simply isn’t as spine-tingling as it once was. Nevertheless the 4 cylinder engine instantly feels more usable. You don’t need those high revs as much as you used to, and that extra spread of torque makes the 4-pot a much more flexible engine. Keener drivers may miss having to work as hard as they once had to, but living with the Boxster day-to-day is now even easier. Driven carefully Porsche claim you’ll get 34.9 mpg and remember, the Boxster also has two boots (to clarify, that’s trunks if you’re reading this Stateside). It’s not perfect. Rearward visibility with the roof up is akin to looking through a letterbox. There’s still little in the way of in-cabin storage for anything bigger than your phone and your sunglasses (I’m assuming your wallet may be tad bulkier). Plus, even if you do manage to match Porsche’s claims of 34.9 mpg, a modestly-sized fuel tank means the Boxster’s range isn’t exactly continent crushing. But hey-ho, travel light, reverse with the mirrors, and enjoy. Think not of the new 718 as a seismic shift, or radical change, but rather as something more akin to the 2016 Toblerone. Bear with me… It may now lack a few of its most famous attributes and it’s pricier than it once was too. But reduced cylinder count or not, rest-assured the Boxster driving experience remains as sweet as it always did. Transmission: 6 speed Manual, rear wheel drive.